If you are a gearhead, you are most likely already familiar with the benefits of porting intake and exhaust manifolds and other engine components to enhance fuel and air flow. But do you know the most effective method for getting this done? It’s extrude hone porting in Fort Worth TX. One of the biggest limitations of hand porting--besides the incredible level of skill and control that is required to abrade the metal evenly--is that it can’t reach deep into the twisting passages of a manifold or other part. Extrude hone porting in Fort Worth TX, on the other hand, can reach every millimeter of all sides of any passage. Extrude hone porting uses an abrasive-laden polymer that can conform to the exact dimensions of the passage. Our polymer media will flow through countless cycles without clogging or separating. Fresh abrasive particles will constantly recirculate to the edges of the media, so you always get even honing on every exposed surface. The process can be controlled with a high degree of precision to ensure that the porting gets done to the exact specs you have calculated will enhance your engine. Any passage that fuel or air flows through can benefit from extrude hone porting in Fort Worth TX. The biggest improvements in engine performance are seen from porting the manifolds, but porting can also improve engine heads, turbo impellers, housings and pumps, and 2 or 4 stroke cylinders. We can’t make specific promises as to how much more horsepower you’ll get or how much fuel efficiency will improve after extrude hone porting in Fort Worth TX, because these end results depend on your specific engine configuration. However, you can expect to see up to 25 percent increase in flow after honing an intake manifold, which will give you an idea of how much performance will improve. 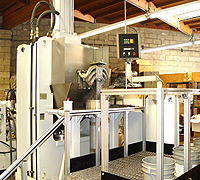 Extrude Hone AFM is a master of the entire process of extrude hone porting in Fort Worth TX. We have thousands of pounds of polymer media on hand to enable us to start your project sooner and get you enjoying your improved engine performance faster. To learn more, please call (562) 531-2976 now.